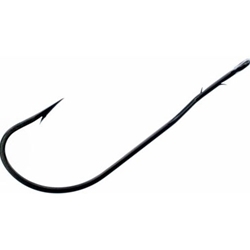 Tru-Turn®'s Brute® Worm Hooks feature a cam-action design which forces the point to turn into the fish's mouth, getting the surest hook set and the deepest possible hold. Outstanding finishes ensure durability and maximum corrosion-resistance. The Brute® Big bite design, ringed eye, 2 slices, spear point.